Wireless Glue Gun-Hi-Light International Inc. The Wireless Glue Gun is great for craft classes & all craft. No more dangerous and restrictive cord. The Wireless Glue Gun is approved by CE, RoHS. Powered by 4 "AA" batteries. Alkaline or NI-H rechargeable batteries are recommended. 4.5 Volts DC, 700mA. Continuously using time for Glue Gun is around 90 ~ 120minutes for Alkaline or 2000mA-hour rechargeable batteries. Hot melt point is around 85C , to use our low melting point Glue Gun sticks is recommended . 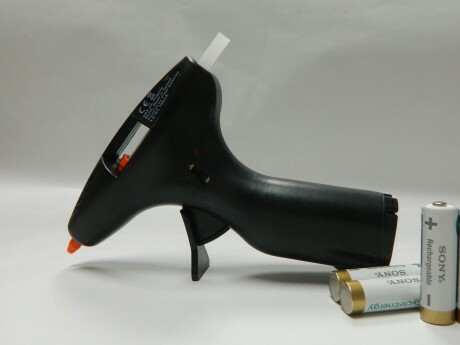 Glue Gun Feature : Low Voltage in using (6V- DC ) with safety . Steady glue flow with good manipulation in fine craft jobs. High performance as well as efficiency in using batteries . Packing: 1pc packed by clam shell include 1 glue stick at 7.2mm, batteries not included.